Mrs Flowers has been the mainstay of the permaculture garden of old. She has been proud to be able to ensure the garden was always cared for, whether keeping predators at bay or providing a place for the homeless, bringing them to her bosom so that they have a place to shelter and feel safe. 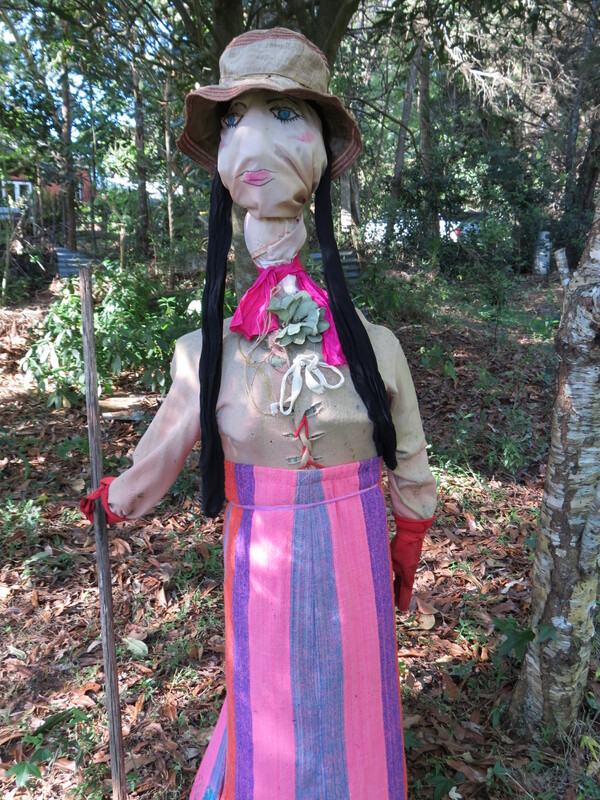 A stylist was summoned to help Mrs Flowers find her new look and after much deliberation, Mrs Flowers decided that her old self, an Aussie woman who stood stead fast in her usual get about the farm wear of a skirt and old pink cardigan with a straw hat placed resolutely about her head, needed to go. Mrs Flowers intimated to her stylist she wanted to have a more worldly look so the workers were sent forth to find the necessary accoutrements to give Mrs Flowers her new look so she may once again enjoy the garden. Once you have seen Mrs Flowers face before her make over, you can never forget it. The stylist made sure that Mrs Flowers new look fitted just right. And her make up gave Mrs Flowers the look she wanted. And now there has been a few changes she decided it was time for her to change everything. So may I now introduce you to Senora Flores from Peru. Senora Flores can now once more look over the garden to make sure those who would like a free feed think twice before venturing into her gaze. Next So far this year…..